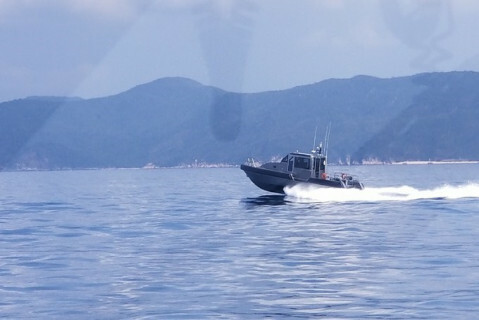 The U.S. has given six fast-response Metal Shark patrol boats to Vietnam Coast Guard Region 3 in the central region. The Metal Shark boats are capable of speeds of 35 knots (65 kph), trailers and spare parts estimated to be worth around $12 ‎million. "Coast Guard Region 3 is unequivocally Vietnam’s most strategic region and arguably its most important, proven by the high skill level of this group of boat drivers, handlers, and engineers," Lieutenant Commander Kristen Byers of the U.S. Coast Guard said at the handover ceremony in Van Phong Bay of Khanh Hoa Province last weekend. Vietnam Coast Guard (VCG) Region 3 oversees the country's waters along the southeastern and south central coast, and offshore waters in the East Sea, known internationally as the South China Sea. The new patrols boats, transferred by the U.S. Embassy in Hanoi, will assist VCG Region 3 to step up its coastal patrols and law enforcement to combat smuggling, illicit trafficking, piracy and armed robbery against ships, as also illegal fishing. Over the past two weeks, trainers from the U.S. have come to train Vietnamese officers to operate the Metal Shark boats. The U.S. embassy, through its Office of Defense Cooperation, coordinates U.S.-Vietnam security cooperation activities on behalf of the U.S. Indo-Pacific Command to advance common defense goals and interests, it said. Last Friday, an official from Boeing revealed that the U.S. company is close to sealing a deal to sell unmanned aerial vehicles (UAVs), the Boeing Insitu ScanEagle, to Vietnam. Last August, a local newspaper quoted an unnamed U.S. State Department official as saying that Vietnam had signed contracts to buy U.S. military equipment worth $94.7 million. Vietnam’s Foreign Ministry has neither confirmed nor denied the information.